Puerto Vallarta is nestled in the midst of 16 miles of Pacific Ocean beaches and lies at the foot of the spectacular Sierra Madre Occidental mountain range. This makes for a wide range of exploring opportunities in addition to some of the most memorable sunsets you will ever experience! Puerto Vallarta features different zones that offer a wide range of internationally branded hotels and independent boutique properties. Each featuring their own soft sandy beaches and unique amenities. Temperatures throughout the year are pretty constant, ranging from mid 80 degrees Fahrenheit (approx. 25-30 degrees Celsius) during the daytime and high 70 degrees Fahrenheit (approx. 17-20 degrees Celsius) during the nighttime. It can get a bit muggy in the early summer months around the end of May and June as the humidity rises, but with the start of the rainy season this generally decreases. Puerto Vallarta, also affectionately referred to as P.V. retains its aura of Old Mexico in its colonial architecture, cobblestone streets, and buildings have to be in agreement with the distinct styling of the town. Puerto Vallarta features many landmarks, such as the famous Cathedral of our Lady of Guadalupe and Casa Kimberley, made famous by Richard Burton and Elizabeth Taylor. 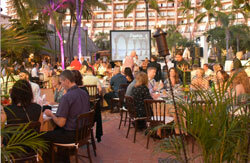 Why Choose Meeting Incentive Experts, Inc.
We use our destination management knowledge and connections in Puerto Vallarta as an advantage for your program. Adam Lawhorne, our CEO, has been in the business for over 15 years. His experience also includes being a past Society of Incentive & Travel Executives (SITE) Chicago Chapter President for 2 years, and he is an active member of the Mexico Tourism Board of Directors. With our proven reputation creating innovative meetings and incentives, we can help you from the planning to the execution of your important Event. Attention to detail is our number one priority to make your program a total success. Contact Our Puerto Vallarta DMC Today!